It’s the second time I’ve seen EB in the last three years, and the third time in my life (in 1968 I saw a charity ref-formation of the original five animals at … Newcastle City Hall). He’s always been a favourite of mine. But this was a far far better performance than at Colne, and that is largely because this is a much more sympathetic band than the one he had in Colne (which featured Billy Watts and Red Young, amongst others – Young in particular had been playing keyboards for EB for some time). As he left the stage, Eric patted the drummer, Dustin Koester, on the back. The others were bound to receive similar treatment for the way they handled the set. 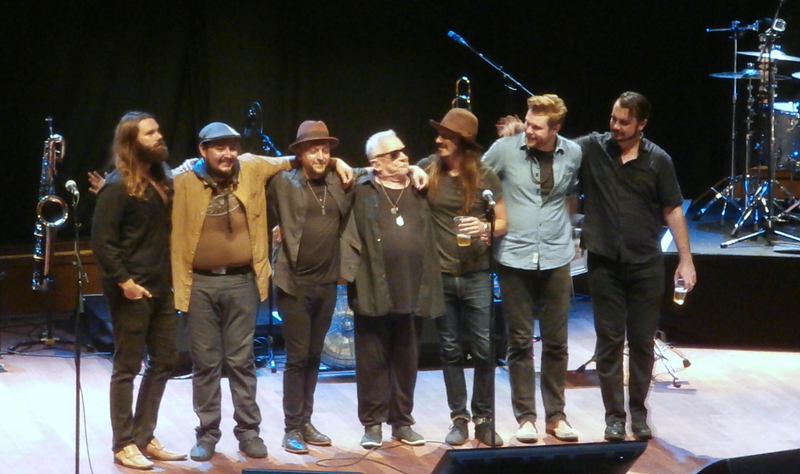 One particular triumph was the inclusion of a small horn section – Ruben Salinas (sax, flute) and Evan Mackey (trombone) – the horns filled out the sound. 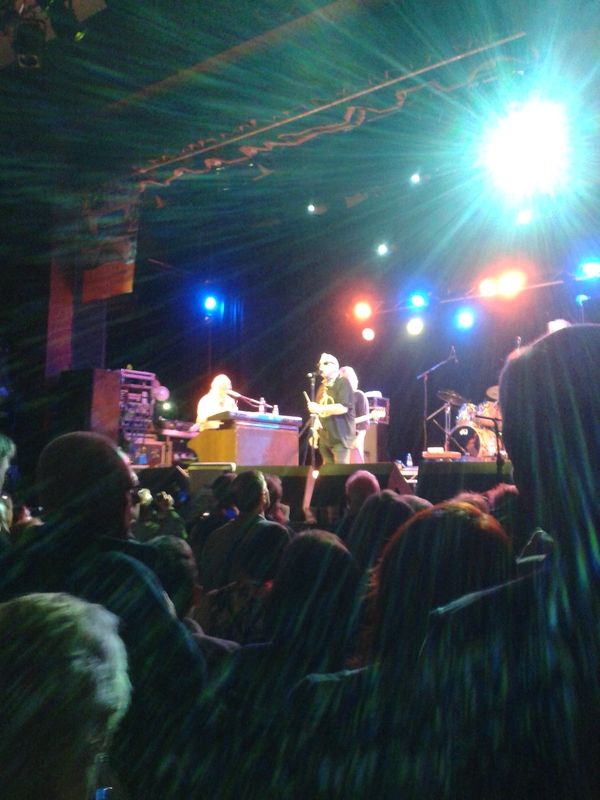 The Young/Watts band was brittle and flashy in Colne; this was altogether more understated, so that when a solo was more heated – Davey Allen on the keyboards on one occasion, I think in the last number – it was a delight. In Colne the solos sounded like habit. Not here. It was an interesting mixture – four from 1966 (Mama Told Me Not To Come was recorded then, but released much later), only three early ones, and three from the 1967/68 incarnation, plus the War single, Spill the Wine. That suited me: if I had to pick a All Comers Top Five, Burdon’s version of See See Rider would be in it. I must have worn out five copies of that single (only a B side in this country), and it suited guitarist Johnzo West’s laconic guitar (very definitely a jam guitarist). In the same way, Monterey, a blistering single from late 1967, suited the bass style of Justin Andres – long loping runs, all propelling the song forward (it’s a list song, a sort of catalogue of the Monterey Pop Festival. This allowed him to tell a story about being given a rose at Monterey by a Hollywood movie actress. ‘I ate it,’ he said, ‘that’s how it was in those days’). But I was most taken with The Pines (recorded by any number of people, including Nirvana at the end of one of their last appearances). You can read the song a million ways. Is it an adulterous woman lying about where she was (In the pines/ In the pines/ Where the sun never shines) the night before? Or someone hiding from the law/ a vicious man/ white ‘justice’? It’s a good song for EB to have taken up with: he is a good blues talker, always has been, and this mixture of song and recitation is perfect for him. 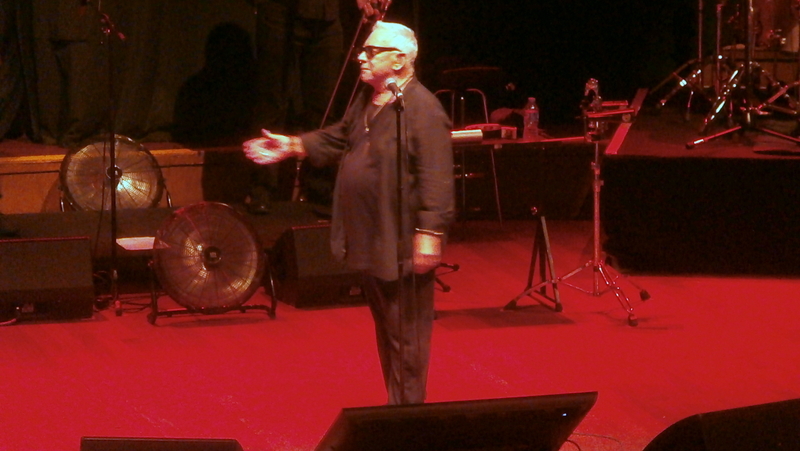 His voice is in great shape – at 75, he hits the higher notes with surprising ease. The concert itself had a major flaws, for which the promoter needs to be smacked on the hand. Doors opened at the City Hall at 7 for 7.30, and at 7.45, a support act, the local codgers Tex, Leon and Friends, who hobbled through some old favourites, but were best with a cover of Apache. At 8.40 or so, enter Marmalade (or ‘The Marmalade’, as they were announced; pity the Jam wasn’t on the bill …). I was never a fan of Marmalade when they had their first hit with Ob-la-di, Ob-la-da in 1968, and I was just as un-keen on their subsequent hits, although my memory is that the hits weren’t quite their live act. These days, they are pretty workaday, even sludgy and poor in places. And the fact is, they are one of those bands that has successively been deprived of every original member – one of the current lot dates to 1975, but the singer has been with them for fewer than five years. Still, it wasn’t so much that I didn’t much care for them, it was that they persisted for 75 minutes, by which time EB’s fans – and we’re not getting younger – were checking their watches and looking at bus timetables. But there was a further disaster. Chris Cross, unfunny local stand-up and magician, ambled on to try some patter about applause and sword-swallowing. He died. If he hadn’t died, he would have been killed. He deserved to be. So the Animals came on after 10, and left not long before 12. They carried the 1800 or so crowd with them, by and large, but not all of the crowd. On the balcony, twenty people left during the performance, and I wonder if it was the timing. (The band was late on in Colne, and was roundly slow-hand-clapped, I recall.) 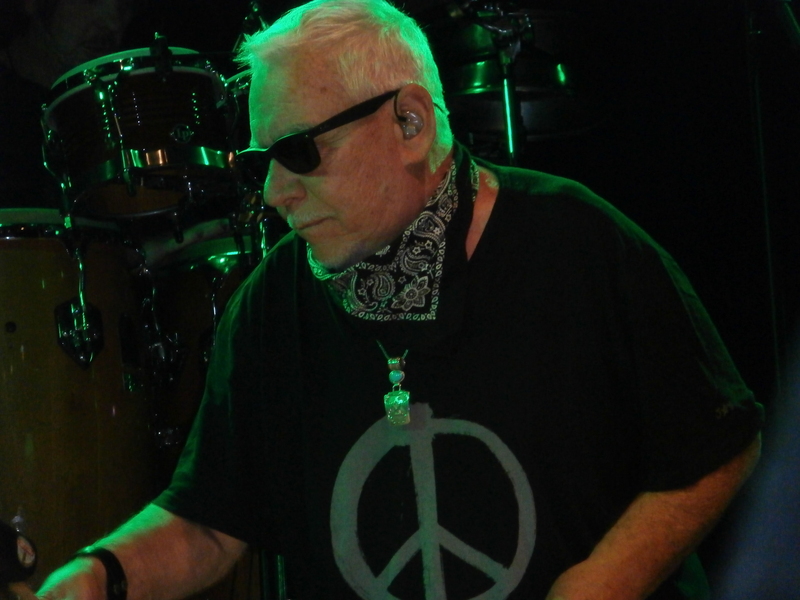 But it may have been a false perception of Eric Burdon and the Animals being part of an Oldies package – as in Marmalade. But he isn’t, and he has long since re-arranged his hits from that era, and feels under no compunction to do them all. Good for him. But some of the audience may have been less in touch with him as a brilliant artist still working out how not to be swamped by his back catalogue. Two stars for the package. 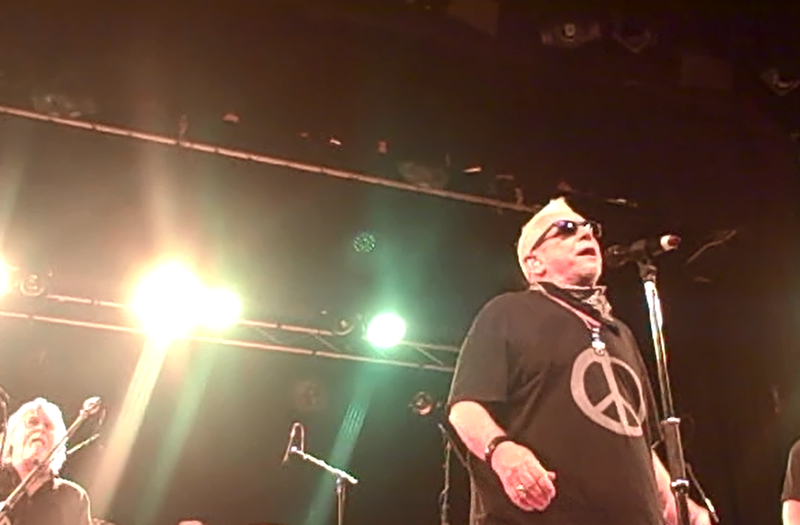 Five for Eric Burdon, though. It is reassuring when a musical idol is still coming up with the goods after five decades. 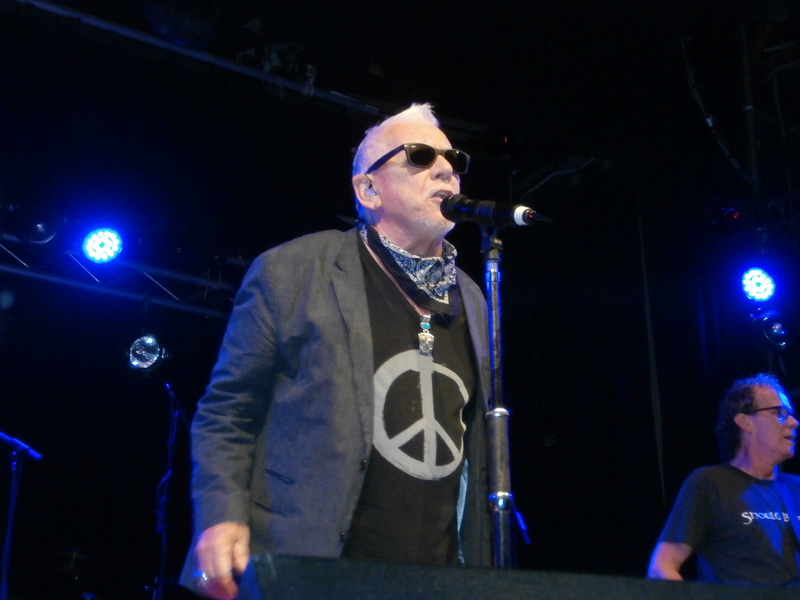 When I was thirteen or fourteen, I used to celebrate Eric Burdon’s birthday – which is today, May 11th. He’s now 68, and shows little sign of slowing down. He was a particular hero of mine because a) he came from the North-East, specifically from Walker (where my mother’s mother was born, not that my mother knew that), b) I liked the Animals’ records more than anyone else’s, and c) and probably most importantly, he had acne. I had acne at that age, too, and it impressed me that, on the photo I had pinned to my bedroom wall, he made no attempt to disguise it. I’m still a fan of The Animals, and of Burdon, although I remember having some deep reservations about an interview he did on a late-night TV show (with Kenneth Allsop) just after Hendrix died in 1970. Burdon said that Hendrix had committed suicide, and that he left a message to Burdon to keep his flame alive. I’m a bit foggy about the details, but I had my doubts about ‘Jimi’s message’. (Burdon had played with him the night before he died, and the bass-player of the Animals, Chas Chandler, was Hendrix’s manager.) To be fair to Burdon, he has consistently linked himself to Hendrix since then, for instance on his website, but something snapped when I saw the interview. My hero had feet of clay. There was a documentary made about a decade and a half ago when all the original five were alive (Chandler is the one who died). The original keyboard player, Alan Price, got the ‘arranger’ credit on ‘House Of The Rising Sun’, and therefore any royalties, which, considering its repeated playing on radio stations across the world, must be substantial (and must also run out in 2014, I suppose, which suddenly seems very close). The documentary was a Geordie comedy, cutting between Price explaining how he had taught the others to play it, and the others, notably Chandler, saying ‘Pricey hated that song. He wouldn’t play it.’ And the arpeggios with which it opened were certainly the work of the guitarist Hilton Valentine (who must deserve an award for having one of the most unlikely real names – it really does sound as if someone else made it up). But happy birthday, Eric. You couldn’t write a song to save your life, but you could interpret them better than any of your heroes. I suspect I used to celebrate with an extra large can of Pepsi (they used to come in two sizes, before someone invented the jumbo plastic bottle). It wasn’t much of a tribute, but I cared. And I still think, if pressed, that the version of ‘See See Rider’ (also known as ‘C.C.Rider’) was one of the best, no, the best single ever made. It is also an odd fact that, because The Animals split up just after recording one of their best albums, Animalism – confusing, because the previous album was Animalisms – the album has never had a release in the UK, and, as far as I know, only one CD release, in Canada.